Selfie sticks undoubtedly get you a great selfie angle. But which stick is for you? Selfie sticks are all the rage right now—people all around the world are ignoring how utterly stupid they look in favor of flattering grainy phone self-portraits. Is it time for you to take the plunge and buy an extendable rod that will get you in trouble at major theme parks? Of course it is. But before you pick up a random selfie stick from Craigslist or the dollar store, let’s take a look at a few different selfie sticks and how they measure up against each other. There are a few different things to look out for when you’re buying a selfie stick, including length (when folded and extended), type of shutter (Bluetooth or wired), overall sturdiness, and clamp size and strength. If you fail to do your research before you buy a selfie stick, you could end up with a stick that’s only a few inches longer than your arm, or that has Bluetooth and a battery that only lasts five pictures. Ta-dah! But which one is for you? We took a look at five selfie sticks (two of which, despite being from different companies, were exactly the same). Read on to see how they compared. 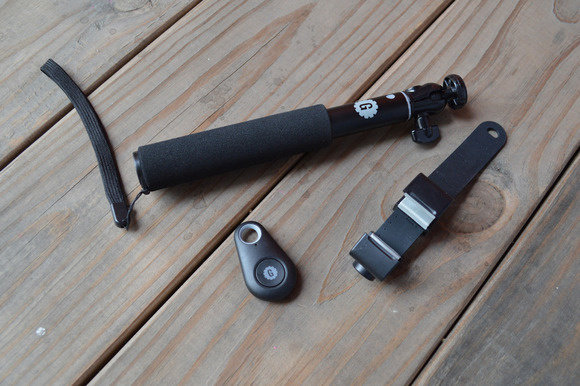 Gorilla Gear’s $30 Selfie Kit is more than just a selfie stick—it’s a selfie kit. The Selfie Kit comes in a foam-lined ‘tough’ plastic carrying case and has four pieces: A selfie stick, a detachable phone clamp, a miniature tripod, and a Bluetooth camera shutter remote. Because this is a selfie stick round-up (not a selfie kit round-up), we’re going to focus on the selfie stick part of the Selfie Kit—which consists of the stick itself, the detachable phone clamp, and the camera shutter remote, because the stick does not have a shutter button on its handle. 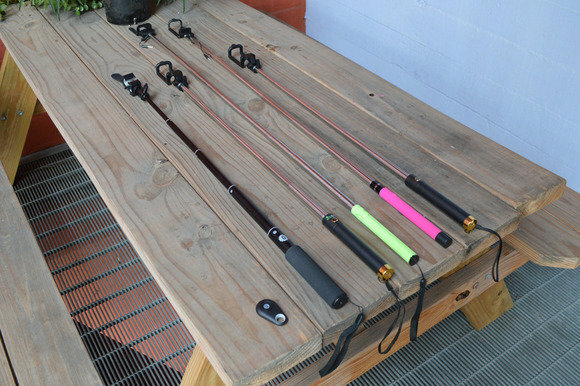 This selfie stick is perhaps the best-looking of the sticks we tested—it’s all black (even the telescoping rod is black), with a foam handle and a flimsy wrist strap that attaches to a loop on the bottom of the handle. It’s also the shortest fully-extended selfie stick we tested, measuring 29 inches from the bottom of the handle to the bottom of the phone clamp. It folds up to be eight inches long, half an inch longer than the GoTech Stealth Bluetooth Selfie Stick and the Solo Stick Premium SE (which we’ll get to in a bit). By itself, this selfie stick feels very lightweight. However, add the necessary accessories (the phone clamp and the remote), and the full kit weighs about five ounces (plus the different parts are easy to misplace). The phone clamp is unique: Instead of being a rigid clamp, it consists of two small rubber-lined clamps linked on a flexible piece of ridged rubber. The top clamp moves along the rubber and locks in place with a separate clamp to secure your phone. The rubber has little markers that indicate about where the top clamp should sit for different-sized devices—the iPhone 5, Galaxy S5, Note 3, iPad mini, and iPad. According to Gorilla Gear, this unique clamp system lets you “treat your phone like a GoPro.” I found it to be fairly secure, but not so secure that I could start swinging it around with abandon or attaching it to the outside of a car. 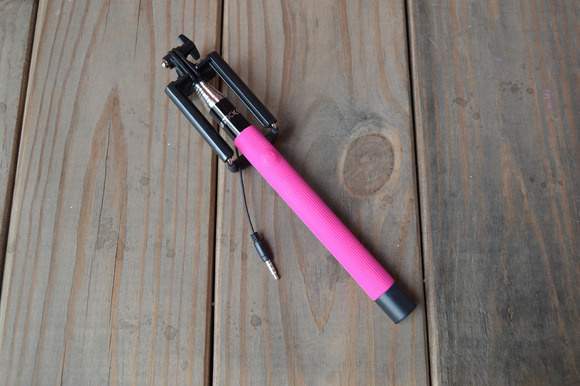 Unlike other selfie sticks, the Gorilla Gear selfie stick does not have a shutter button on its handle. Instead, you’ll need to use the Bluetooth remote (which runs on a watch battery) to snap your photos. This is fine—the remote has a large, easy-to-press button and thankfully doesn’t have to be charged—but unless you attach the remote to your stick… I suspect you’ll lose it almost instantly. Gorilla Gear’s Selfie Kit is attractive and well made, and it looks nicer and more expensive than the selfie sticks you find in the $3 bin at Fry’s. But there are too many moving parts for my liking—I lose small, detachable electronic items very easily—and it’s short at just 29 inches long. 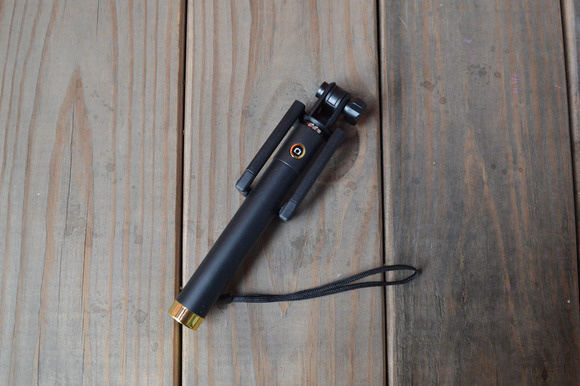 GoTech’s $20 Stealth Bluetooth Selfie Stick is compact and lightweight—in fact, it’s the most compact selfie stick we tested, measuring just 7.5 inches long when folded—and it looks exactly like the Solo Stick Premium SE. This Stealth stick is black with plastic gold accents, and is definitely on the shorter side at 30.5 inches long from the bottom of the handle to the bottom of the phone clamp. It has a gold-trimmed shutter button and a microUSB charging port on the bottom of the handle (plus a slim black wrist strap). The Stealth Bluetooth selfie stick has a more traditional rigid phone clamp that’s permanently attached to the top of the stick and folds over on itself for a compact design. To place your phone in the phone clamp, just pull up on the rubber pull tab and squeeze your phone inside. The clamp fits both the iPhone 6 and the iPhone 6 Plus, but anything bigger (like a tablet) isn’t going to work. Once your phone is inside the clamp, it feels sturdy and stable. This stick is a Bluetooth stick, which means it connects to your phone via Bluetooth and remotely triggers the camera shutter. This also means that it needs to be charged—which is fine in theory, but realistically, I already have a lot of electronics to charge (such as my phone, my Apple Watch, and my laptop), and so a selfie stick doesn’t really get priority when it comes to plug space. The Stealth Bluetooth stick does come with a short microUSB cord for charging (but not power supply unit). Once charged, the battery lasts for several days, assuming you’re not Kim Kardashian. If you want a Bluetooth selfie stick, the Stealth Bluetooth Selfie Stick is worth your money—though you can pick up the exact same stick from Solo Stick for $5 less. The rubber-covered handle is thick and sturdy, so you won’t feel like it will slip out of your hands when you’re taking dangerous, cliff-hanging selfies. The shutter button is easy to press (not the case on all selfie sticks) and the clamp really feels like it grips your phone. The Stealth Bluetooth Selfie Stick definitely wins in size and weight (it weighs 4.2 ounces, 0.2 ounces lighter than the exact same stick from Solo Stick), and it’s probably the stick I would buy, since large selfie sticks embarrass me. Looq’s $20 DG selfie stick comes with its own app, because sometimes you need a selfie stick-approved app to take your pictures, I guess. This isn’t even just a generic Looq app, it’s an app that’s specific to the DG (though I suspect it’s similar to the generic Looq app). The app is available for free on both iOS and Android. The DG is a pretty typical wired selfie stick. It has a ridged rubber handle (blue, green, or red), a slim wrist strap, and a metal telescoping rod that extends about 42.5 inches (from the bottom of the handle to the bottom of the phone clamp). That makes it our longest selfie stick by about three inches, but it’s also the longest when it folds up (12 inches with the clamp, nine inches without it). The DG’s clamp is removable, which is useful for storage but inconvenient for people who lose things. The clamp itself has a foam-lined bottom and a rubber-lined top, but while the bottom of the clamp is almost two inches wide, the top part of the clamp that touches your phone is just a quarter of an inch wide. Still, the phone feels sturdy inside the clamp, so long as you don’t shake the stick around too much. The clamp fits both the iPhone 6 and the iPhone 6 Plus, and has a rubber tab on the top to make it easy to put your phone inside. To snap a photo with the DG, you first plug your phone in via a coiled wire at the top of the stick. The wire plugs into your phone’s headphone jack, which allows it to trigger the camera shutter. Minor detail: The wire exits the selfie stick from the side, which means you may need to adjust your phone depending on whether the headphone jack is on the top or the bottom. Once your phone is plugged in, all you have to do is open up the camera app or the Looq DG app and press the raised shutter button on the DG’s handle to take a picture. The DG’s shutter button isn’t my favorite of the bunch—it’s harder to press than the big, flat button on the GoTech Stealth Bluetooth selfie stick. The Looq DG app is a very basic camera app. In this app, you can take photos, switch cameras, turn the flash on and off (both when you’re taking pictures and separately, like a flashlight mode). You can also take photos with filters, such as ‘film,’ ‘lomo,’ ‘black & white,’ and ‘sketch.’ The app does have automatic focus that finds faces, but so does your iPhone’s camera (it’s the little square that appears around people’s faces), and you can also tap to focus. 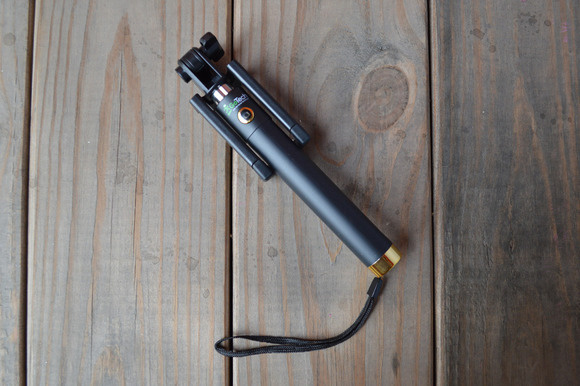 The Looq DG is a sturdy selfie stick that makes sense if you’re looking for length. It’s not particularly lightweight at five ounces, nor is it very compact unless you take the clamp off of the stick (and promptly lose it). When the clamp is on the stick, it doesn’t fold backward on itself—it actually doesn’t fold past a right angle. I am a fan of wired selfie sticks because I frequently forget to charge things, and this stick will never run out of batteries at the worst possible moment. As for the app, that’s not really a selling point—I wouldn’t use it, and neither will you. SelfieOnAStick’s $25 Wired Selfie Stick is the lightest selfie stick in our round-up, weighing just four ounces. 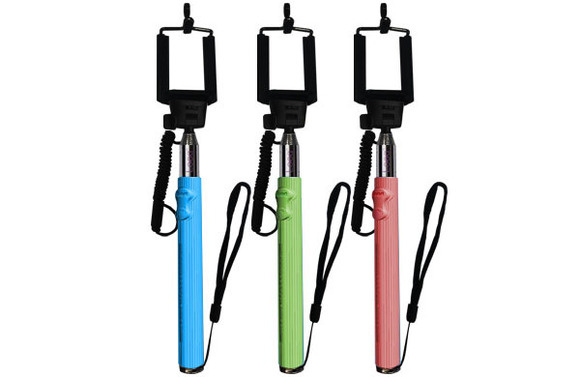 The Wired selfie stick comes in a variety of bright colors (green, purple, pink, light blue, and black) and has a slim handle with a ridged rubber grip and a compact, foldable design, making it the perfect travel companion. The Wired selfie stick, as you might have guessed from its name, is wired. It has a short, half-coiled wire that plugs into your phone’s headphone jack to trigger the camera shutter. The wire on this selfie stick protrudes from the back of the stick, so it’s easy to plug into your phone no matter which side the headphone jack is on. While a wired selfie stick might seem a little clunky versus a Bluetooth stick, the Wired selfie stick doesn’t need to be charged or paired with your phone, nor does it sap battery life from your phone by forcing it to use Bluetooth. The Wired selfie stick has a typical rigid phone clamp that folds back onto the stick for a more compact design. To put your phone in the clamp, just open the clamp (there’s a small rubber tab on the top of the clamp for easy maneuvering) and put your phone inside. The clamp has a foam lining, which means it’s sturdy but not quite as stable as a clamp with rubber lining – if you shake this stick around enough, your phone will move and possibly dislodge. But you’d need to shake it pretty hard, and I’m not sure why you’d be doing that in the first place. This stick may be lightweight, but it feels sturdy and (relatively) well-made. The handle is slimmer than the other selfie sticks’ handles in our round-up, which didn’t bother me but might read as flimsy to some people. The bottom of the handle is plain black plastic—no wrist strap, which seems like an oversight—and near the top of the handle is a small, raised button for triggering the camera shutter. I’m not a huge fan of this button, because it’s small, covered in rubber, and not very comfortable to press (it feels like you’re pressing the head of a pin, rather than a button). SelfieOnAStick’s Wired Selfie Stick is not a bad choice, but it doesn’t feel quite as sturdy or as high-quality as some of the other sticks we tested. Some lack of sturdiness is to be expected with a lightweight selfie stick, and this stick does have its plusses—for example, it extends to be an impressive 39.5 inches (from the bottom of the clamp to the bottom of the stick) and folds into a relatively compact 9.25 inches. Solo Stick’s $15 Premium SE selfie stick is a lot like the GoTech Stealth Bluetooth Selfie Stick, only $5 cheaper. And when I say ‘a lot like,’ I actually mean ‘basically an exact replica.’ Both the Solo Stick Premium SE and the GoTech Stealth Bluetooth Selfie Stick are ‘new’ models, so it’s hard to tell who contracted the manufacturer first. But all the good (and bad) things about the GoTech Stealth apply to the Premium SE—this stick is super compact, has cool-but-sort-of-cheap-looking gold accents, and features Bluetooth. There are a few minor differences between the Solo Stick Premium SE and the GoTech Stealth Bluetooth Selfie Stick. For one thing, the Premium SE does not have a GoTech logo above the shutter button. Also, it’s 0.25 inches shorter, because the GoTech stick has a quarter-inch more metal sticking out above the handle. Finally, it’s 0.2 ounces heavier (the Premium SE weighs 4.4 ounces), but that probably says more about quality control than anything. The Premium SE has a grippy rubber handle and a sturdy rubber-lined phone clamp that folds backward onto the handle for a compact design. There’s a rubber tab on the top of the phone clamp that makes it easy to place your phone inside the clamp, as well as a locking mechanism that lets you adjust (and lock) the angle of the clamp. The clamp is large enough to accommodate an iPhone 6 or an iPhone 6 Plus. Whether you go for the Solo Stick Premium SE or the GoTech Stealth Bluetooth selfie stick, you’re making a good choice. This stick is short, sturdy, and cheap, and so long as you remember to charge it (the battery lasts about 3 days on standby), it’s one of the more subtle selfie sticks. Have a selfie stick that you’re particularly fond of, or are you secretly hoping that they’ll start spontaneously combusting like the hoverboards? Sound off in the comments.